Mooove over, cows. There’s another milk that’s pleasing the palates of consumers. WASHINGTON — Mooove over, cows. There’s another milk that’s pleasing the palates of consumers. Goats are making their mark on the U.S. dairy industry. When Cathy Soult’s husband passed away in 1993, she had to find a way to keep her central Pennsylvania farm up and running. Goats, she concluded, were the way to go. Initially, Soult raised the animals for export. But when Mexico closed its borders amid fear of mad cow disease, she held on to her animals and decided to go into the dairy businesses — even though she wasn’t convinced there would be a big enough market. Farmers markets are a wonderful way to get your hands on local goods and produce. But one local farm gives customers the chance to get even closer to the source. Meet the “kids” and creators behind Firefly Farms in Garrett County, Maryland. “Only because I wasn’t in-tune with what the public wanted,” says Soult, who runs the farm, Wayside Acres, with her daughter, Gwen. But over the years, the market found Wayside Acres, and now the mother-daughter operation has more business than it can handle. In 2014, the nation’s dairy herd grew 2 percent from the previous year, and producers reported a 15 percent increase in sales, The Associated Press reports. Furthermore, sheep and goat milk raked in $92.2 million in 2012, which is a third higher than sales reported in 2007. Savvy consumers in search of healthier and more sustainable food products can take credit for driving this trend. 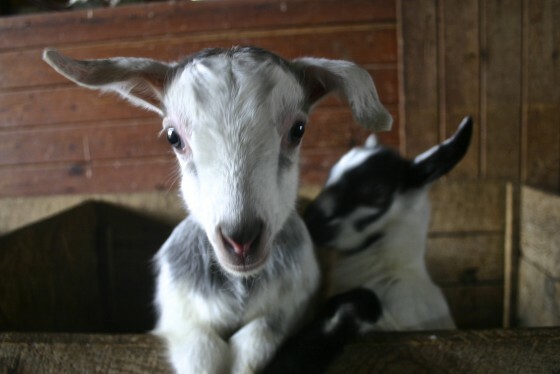 Goat milk has more calcium, magnesium, potassium and vitamin C than cow milk, Modern Farmer reports. It’s also naturally homogenized, which makes it easier to digest. That’s because the protein structure of goat milk is different from cow’s. It still contains lactose, but many who have allergies to cow milk are still able to consume goat milk. In fact, it’s often recommended by pediatricians for young children who have difficulty transitioning from breast milk to conventional dairy products. Environmental sustainability also plays a role in the nation’s growing taste for goat milk. Soult says goat dairies don’t have the same manure problems that plague their cow counterparts. “And you can raise a lot of goats on a small amount of acreage,” says Soult, who explains that farmers can typically account for one cow per acre, compared to 10 goats per acre. At the 43-acre Breezy Way Farm in Bedford, Pennsylvania, Heather Hall and her husband, Luke, keep about 225 dairy goats. Each animal produces about a gallon of milk a day. Unlike Soult, the Halls don’t process the milk on their farm. They work with Trickling Springs Creamery, a family farm-focused processor and supplier, to pasteurize their goat milk and distribute it to markets throughout the area, including a retail stand at Union Market, MOM’s Organic Market and Whole Foods. Joe Miller, director of marketing for Trickling Springs, says after 11 years of working with local cow farmers, the creamery decided to build the equipment necessary to take on and process goat milk. In 2012, Trickling Springs worked with four goat farmers; now, it has 12 and is looking to add more. Lee Robinson, a dairy and frozen category buyer at Whole Foods Market, says Whole Foods stores in the D.C. area have been carrying goat milk for a number of years after receiving requests from customers. “It started for early adopters looking for another option to cow’s milk dairy — just a local request here and there through the stores,” Robinson says. Now, most Whole Foods stores are stocked with goat milk. And while Robinson says the demand for goat milk is still present, a number of plant-based milk alternatives, such as almond milk and coconut milk, have kept its sales from skyrocketing. “So it’s a little bit different of a landscape than it used to be,” Robinson says, about all the milk alternatives that have surfaced in recent years. Robinson says for a while, Whole Foods carried goat milk ice cream. Now, it’s harder to find. But customers can find goat milk in butters, infant formulas and, of course, cheeses. “Overall, the availability and variety of goat’s milk cheese has grown, I’d say, over the last three to five years,” says Amy Gomez, regional specialty coordinator for Whole Foods. Gomez says shoppers seek out goat cheese for its unique flavor, but they also gravitate to goat for its nutritional profile. “It’s lower fat, lower calorie, lower cholesterol and higher in calcium than cow’s milk,” she says. 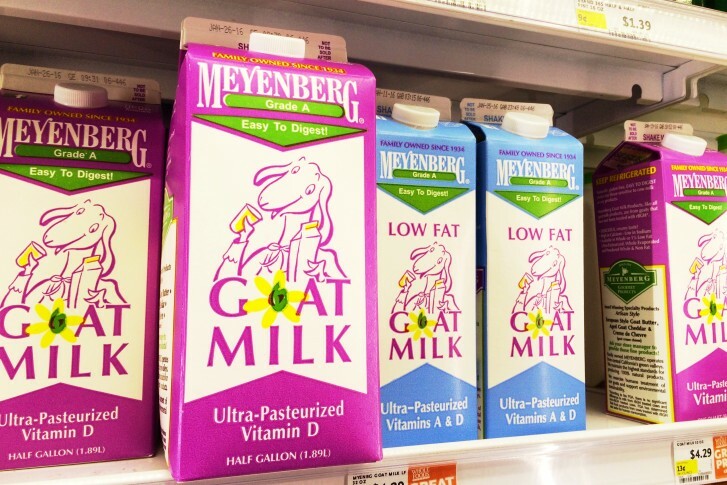 Trickling Springs’ Miller says because of its broad appeal, consumers will likely see more goat milk products on grocery store shelves in 2016. “You already have goat cheese, and I think that will keep going, but I think you might see some more goat yogurts out there, you may see some goat butters, some flavored goat milks. I think you can expect some of those over the next few years as awareness and interest in goat milk keeps growing,” he says. One hurdle the goat milk industry has to overcome before it makes a bigger splash is taste. Soult says goat milk has a reputation for being musty and strong in flavor, but that couldn’t be further from the truth. “If you’re getting really fresh and good quality goat milk, it should taste like cow milk and it shouldn’t have a taste to it,” she says. Plus, she says the rich and creamy nature of goat milk makes it a great cooking alternative to conventional milk — especially when it comes to making ice cream. Breezy Way Farms’ Hall says other farmers are taking note of the growing goat industry. She says she’s constantly fielding questions from people interested in starting their own operations. “It’s crazy how many goat dairies are starting up. Now there’s more and more people who want to get into it,” Hall says. And while goat milk may never surpass the supply and demand of cow milk — dairy cows produce about 20,000 more pounds of milk annually than goats, and cow milk accounted for nearly 95 percent of milk consumption in 2014, according to The Associated Press — goats are proving the grass is just as green in their pasture.